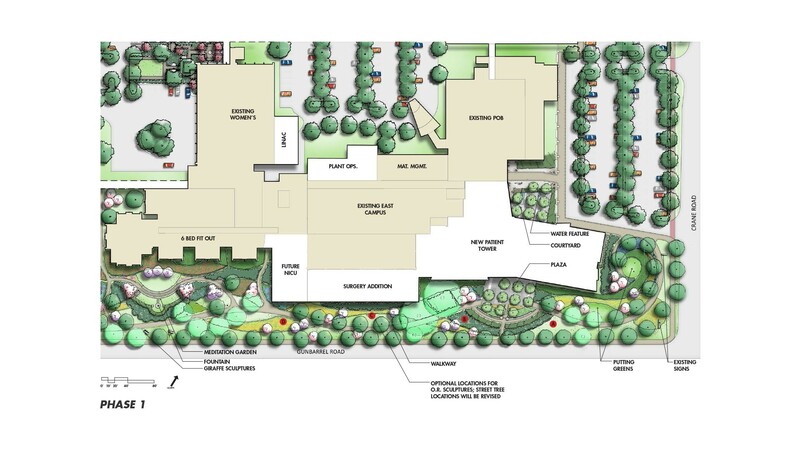 In collaboration with the project architects, CRJA-IBI Group created the landscape master plan and provided full landscape architecture services for this 30 acre medical campus. The Erlanger East Hospital is a primary hospital located in Chattanooga, TN that wanted to expand its facility to address the needs of the community and create an inviting space for patients and staff. In addition to adding patient wings, an EMS building, and an expanded administrative wing the owners wanted to address the outdoor environment. Program elements were chosen based on the targeted user groups’ wish lists in addition to collected health data and analysis. Elements include a trail system throughout the property, community garden for patients, staff, and neighborhood residents, multiple meditation gardens, a passive recreation pond, playground, farmers market, edible gardens, multiple plaza courtyards, volleyball and bocce ball courts, and a helipad for incoming emergencies. The project utilized a Health Design Assessment™, a collaborative effort between CRJA-IBI Group and Designing4Health, to identify design strategies aimed at supporting healthy eating, physical activity, and mental well-being through the design of the built environment. Several program elements incorporated into the plan directly mitigate the leading issues of the area.